Our first sponsored child, adopted in 2002, was Mayra Beatriz Angamarca from Ecuador. When she turned 18 the sponsorship ended and we wish her well as she has matured into a wonderful young woman. 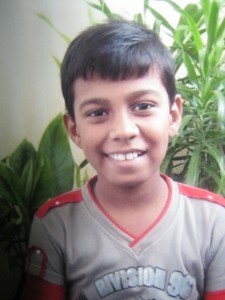 Mohammad Gufran, from India, has been our child since 2007. He is now 14, speaks Hindi, and his favorite subject is languages. He and his family live in a one-room concrete home with no running water or bathroom. The family uses community faucets for their water and a community latrine and they cook on a kerosene stove. Mohammad lives with his father, a daily worker, mother, two older brothers who will soon be out of the house, and a younger sister. Their monthly income is approximately $150, less than a U.S. family might pay for a day’s outing at a theme park. Children International sponsorship is open to all. The monthly cost is $25 per child plus the opportunity to send gifts for special occasions. You can see how $25 can greatly impact the quality of life for these family\kies. It enables the children to attend school properly dressed and fed. The organization does amazing things with small amounts of money. It is a special privilege to meet these special children and to watch them blossom.